This page will be reposted around the middle of June, as soon as SOI and UAH data for the previous month are available. We’ll see how we go with this calculation! 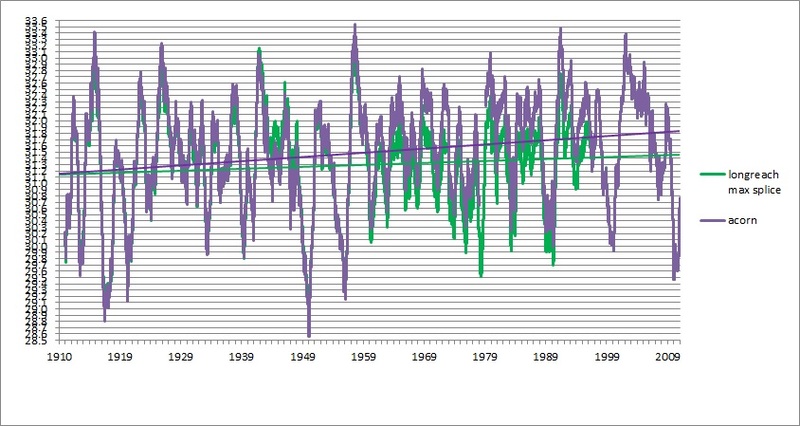 If we enter a new El Nino phase we can expect global 12 month mean temperatures to rise steadily in the last part of 2012 and more rapidly in 2013, peaking about mid-year. 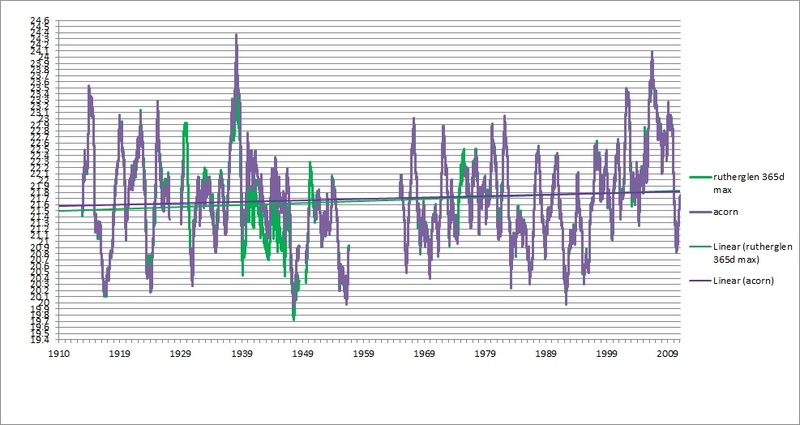 If we remain in a neutral phase, 12 month mean temperatures should stay in the +0.1 to +0.2 range for the next 18 months. A renewed La Nina will lead to temperatures dropping below +0.1, possibly to below 0.0 if La Nina is strong enough. Last month I tipped “The next weather enhancement for SE Queensland and NSW will be in about five to seven weeks- late May to early June.” As the winter pattern is now established, that appears to hold, but there may be a mid to late June influence. 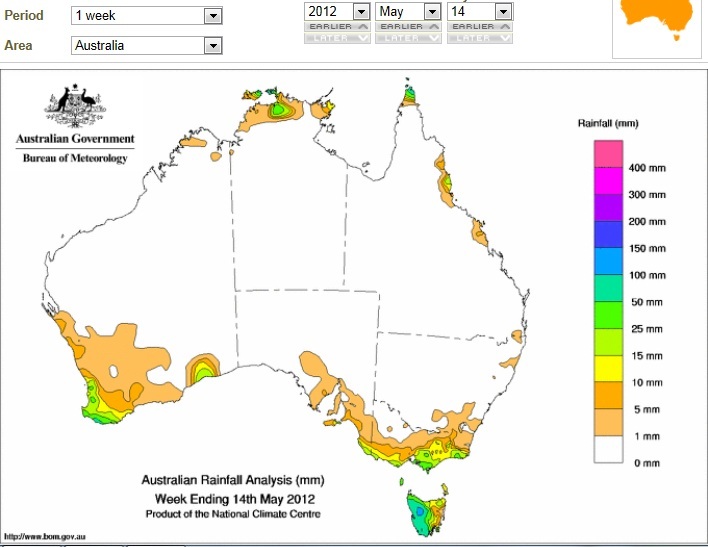 Here are weekly rainfall maps for the past few weeks. I was plain wrong about the late April disturbance. Readers may have come to this site via a poster campaign, featuring (with my permission) graphs of adjustments to minimum temperatures at Rutherglen, Victoria. 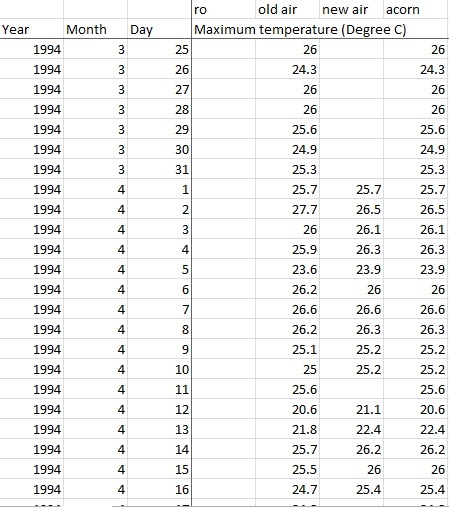 The graphs show comparisons of unadjusted daily temperatures as shown at Climate Data Online, with temperatures downloaded from the Acorn site (see below.) The daily temperatures have been smoothed with a 365 day running mean and linear trends are shown. The amount of adjustment in the Acorn data is clear. Pleased read on for a full explanation. 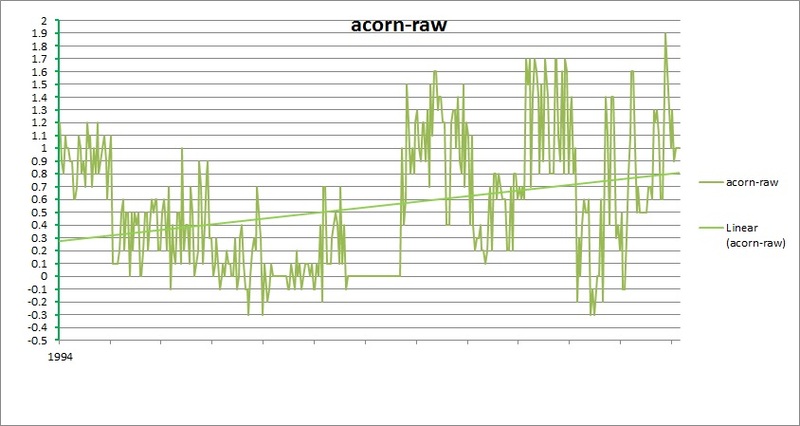 In March 2012, a new daily temperature reconstruction was released, called the Australian Climate Observations Reference Network- Surface Air Temperatures, or ACORN-SAT (Acorn). 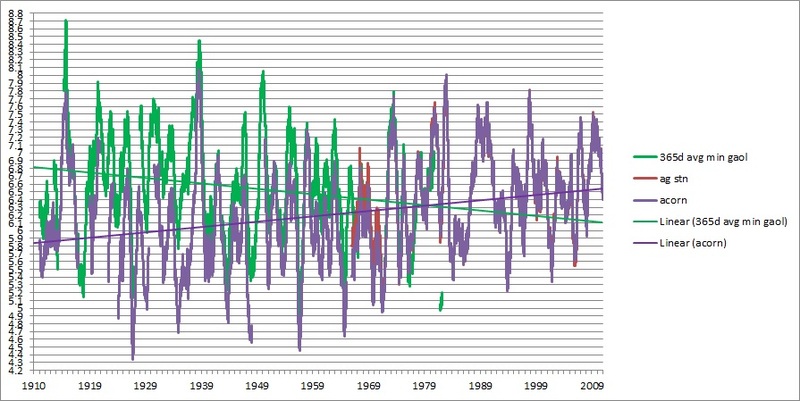 It appears that the previous “High Quality” Annual and Daily series will be quietly forgotten, as it had become apparent that they had significant, but never admitted, problems (see my previous posts: The Australian Temperature Record Part 8: The Big Picture; Part 9: An Urban Myth, and Part 10: BOM’s “Explanations”.) 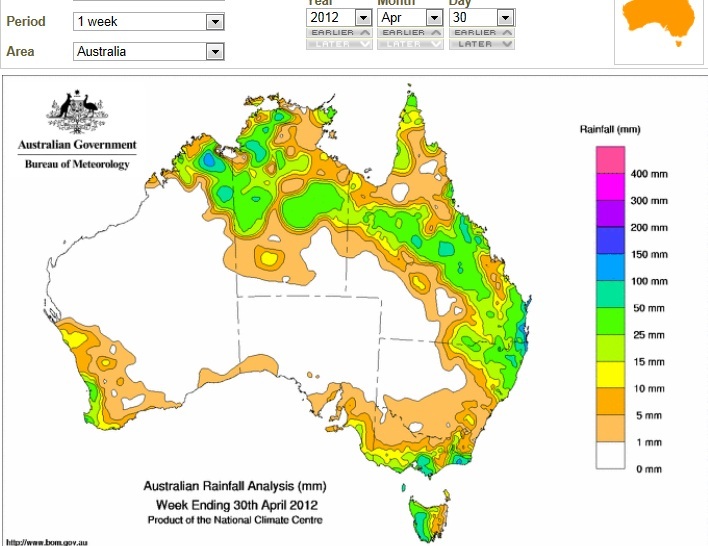 Congratulations are due to the Bureau of Meteorology (BOM) for the excellently presented information, including (some) metadata for all sites, technical papers giving excellent background and describing the homogenising process in some detail, and easily accessible data files. The authors make a number of claims about Acorn’s quality and robustness, however a number of problems can be identified. They have produced a daily record for the last 100 years. 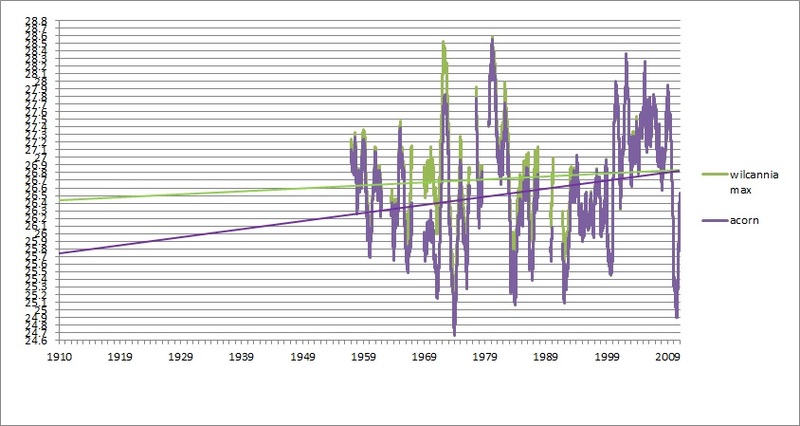 Increasing data quantity post 1960 gives more confidence that the warming trend is strong and increasing. 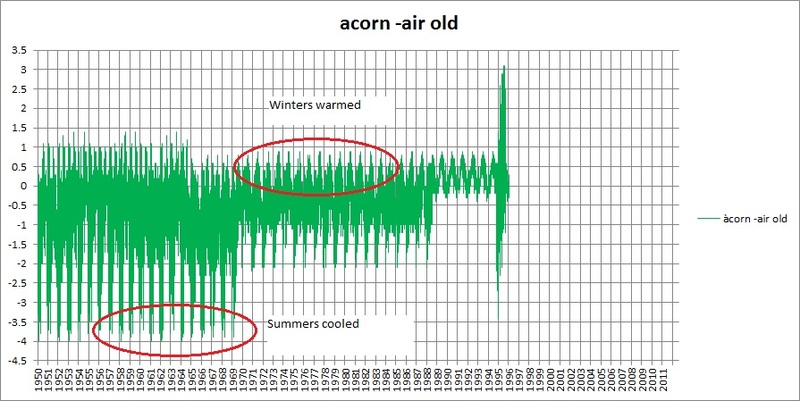 Acorn produces similar trends to those already shown by previous Australian and international analyses, (which is true), and allows improved analysis of the frequency of hot and cold extremes. There is an approximate balance between positive and negative adjustments for maximum temperature but a weak tendency towards a predominance of negative adjustments (54% compared with 46% positive) for minimum temperature. The record is much shorter than 100 years for a significant number of sites. For many others, the Acorn record has many gaps and contains spurious errors which imply poor quality control. 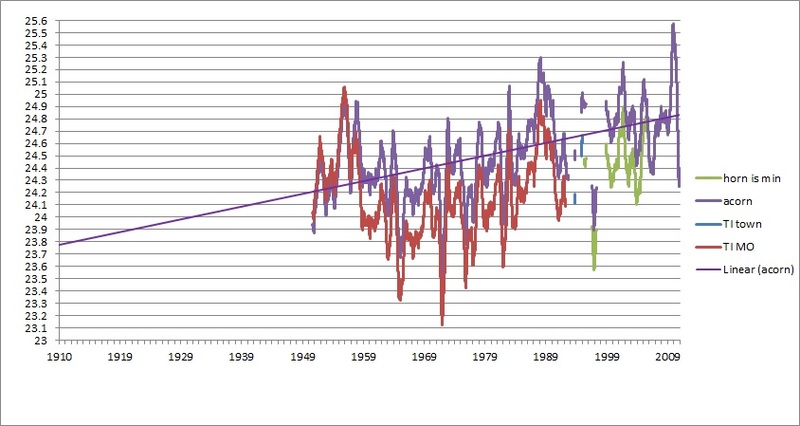 Post 1960 data indeed indicate warming but this is not the case over the whole period. 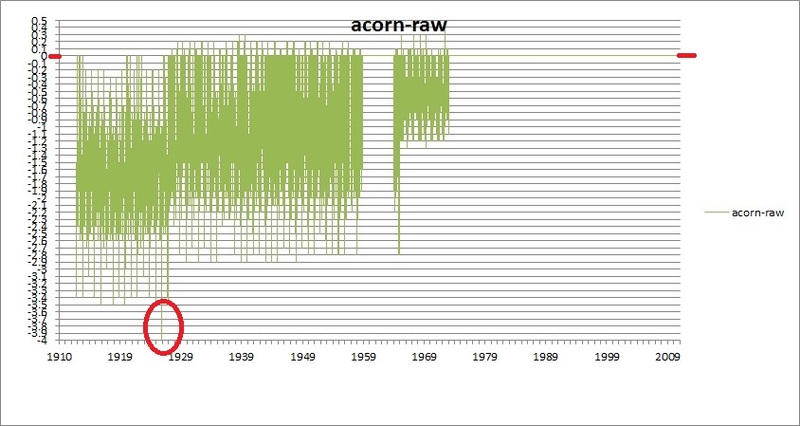 Acorn’s trends indeed reflect those of previous analyses but not those drawn from the raw data. 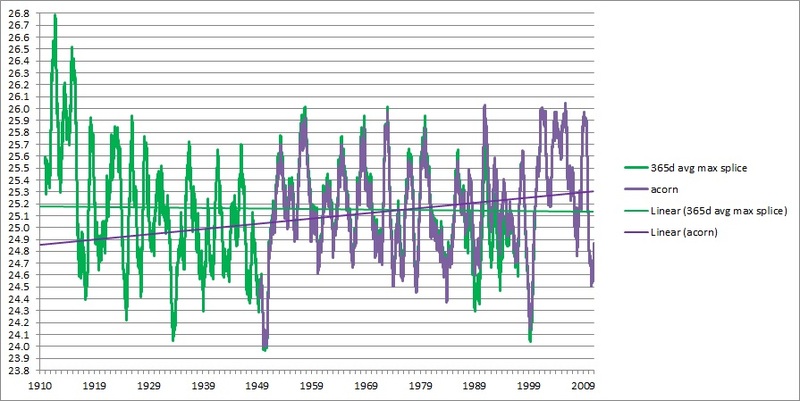 Hot and cold extremes have been adjusted, usually warming winters and cooling summers, and at some sites new and more extreme records have been set. 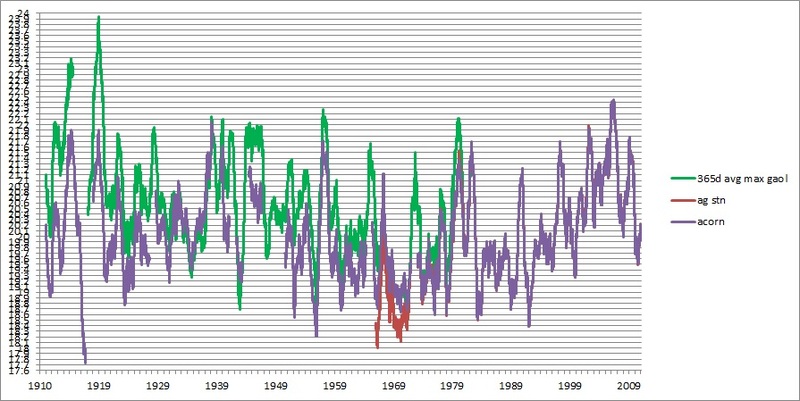 While there may be a numeric balance of positive and negative adjustments, analysis of a representative sample indicates that adjustments predominantly increase warming. 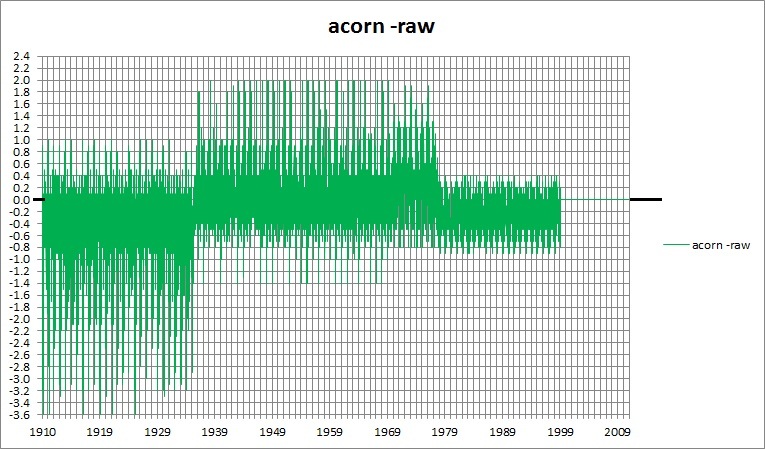 The Acorn record is impossible to replicate. 1. Metadata: The metadata in the Station Catalogue are not complete and are in some cases misleading, as will be shown in the analysis of a sample of sites. Never the less, the metadata file gives some interesting information: many sites by their own description are very poor, with no overlapping data for station moves, but the authors claim the homogenisations successfully account for this. There is no listing of adjustments, neither is there a list of reference sites used for comparison. Code has not been released, and it is impossible to replicate Acorn. Missing data and large gaps plague a number of Acorn sites. Acorn’s data coverage is 81.4% of the possible 1910-2011 data available at each site (excluding the 8 urban sites). Selection of sites will be discussed further in points 5 and 6 below, however there is another consequence of site selection: length of record. 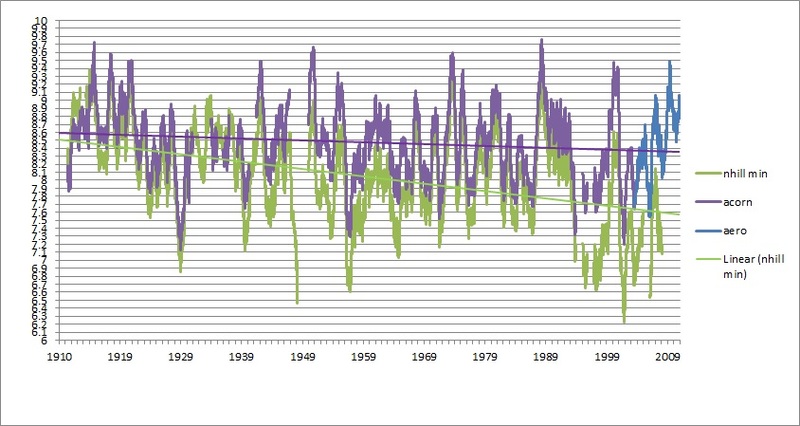 In 1995, Torok and Nicholls constructed a long-term climate record for Australia. For this they needed long term sites, those with at least 80 years of monthly data, and were able to create composite records so that 224 stations “were open by 1915”. Of the 112 Acorn sites, 40 or 35.7% have less than 80 years of daily data. This increases the uncertainty of any analysis of trends. The problem is that large amounts of daily data have not yet been digitised- this must be a top priority. 3. 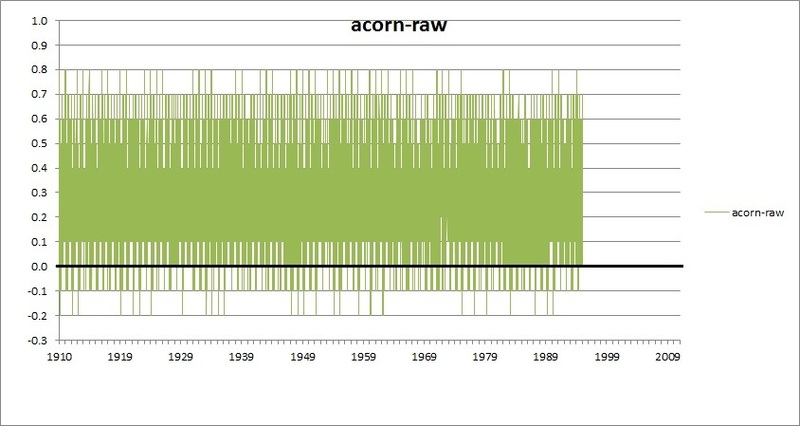 Data Precision: Although Acorn’s authors specifically address (and dismiss) the issue of the metrication change in 1972 and the incidence of rounded observations in both Fahrenheit and Celsius eras, an audit of all Acorn sites by Chris Gillham has reinforced what we found in our audit of the Annual HQ sites: before 1972 very likely more than 50% of sites’ observations were rounded. 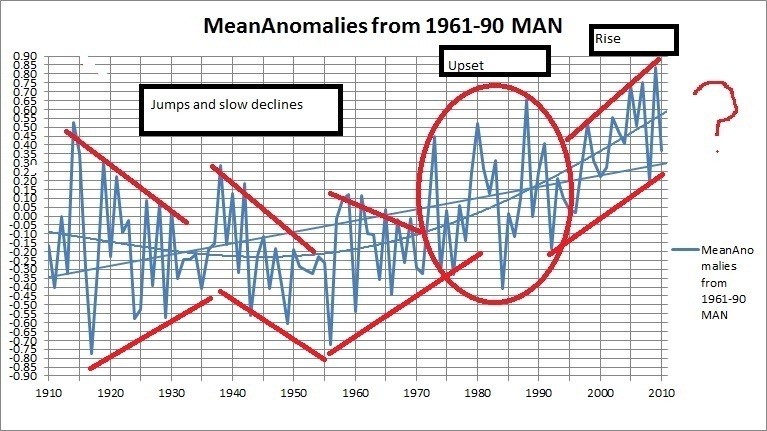 Acorn’s authors admit a possible 0.1C increase in the 1970s as a result of this, but contend that there was too much climate variability due to ENSO activity in this period to verify this. I would agree about the ENSO variability, however this inability to distinguish between signals itself demonstrates how poor and imprecise the record is. 4. 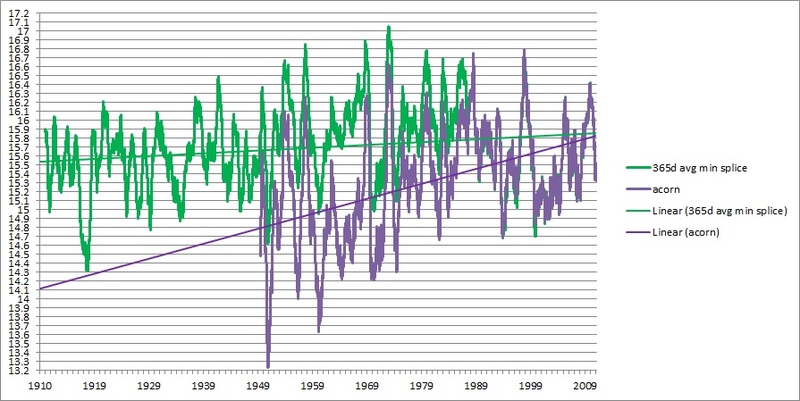 Adjustments have reversed cooling trends and strongly increased warming trends apparent in the raw data at the sample of sites studied. 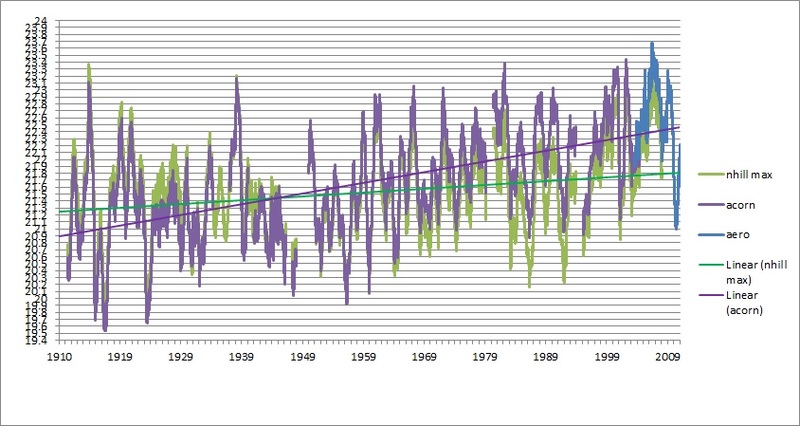 Frequently winters are warmed and summers are cooled, thus reducing extremes. 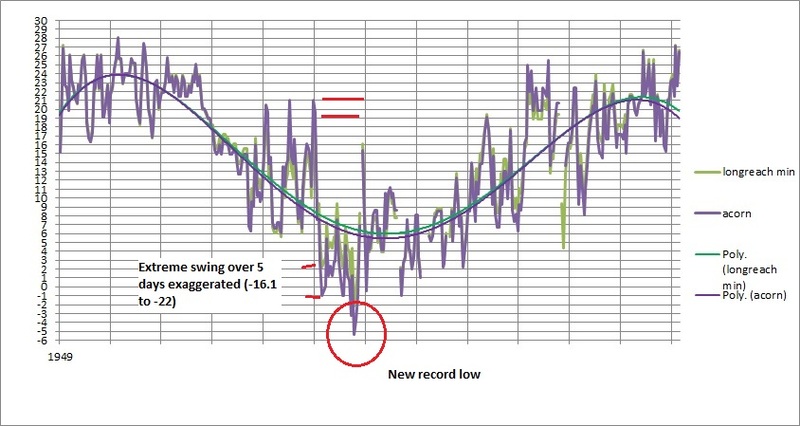 The earlier part of the record has been cooled and the later part warmed, increasing the apparent warming trend. 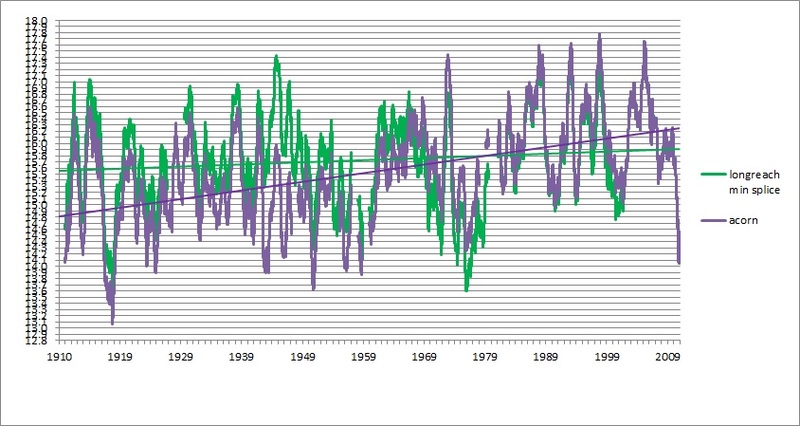 Note: this does not show the global warming signal, which is that warming should be apparent at night, in winter, and towards the poles, such that the diurnal range decreases. Note I show both 2nd order and 4th order polynomials, as well as linear trend lines. Acorn’s authors use quadratic or 2nd order. 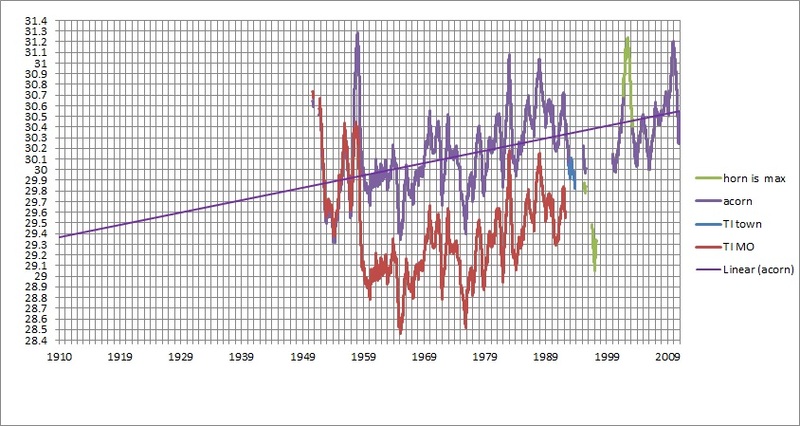 This trend (+0.65C/100 years) is nothing like that of Acorn (+0.9). Although Acorn’s authors state that there are almost equal numbers of positive and negative adjustments, the result appears to be stronger warming trends. 5. Site selection: The Acorn set of sites is based on Trewin’s 2001 network, and overlaps the HQ Annual sites: of the 134 HQ Annual sites, 78 are common (or close substitutes), with 34 different sites. The Acorn authors explain the care taken with site selection, in CAWCR Technical Report No. 049. 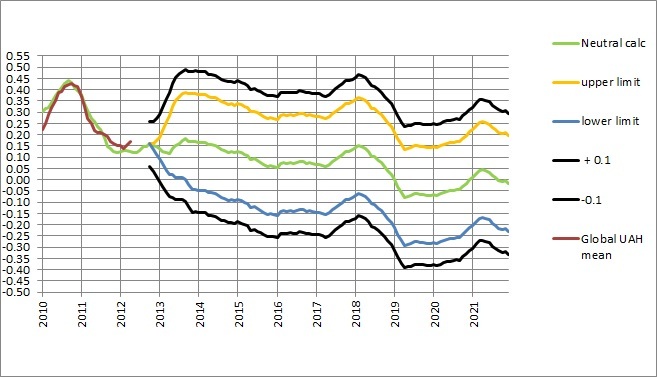 The average trend of annual raw mean temperatures for the unused HQ sites is +0.51C/100 years, while the raw trend for the sites maintained is +0.71. Let me be quite clear: there is no suggestion of deliberate bias in selection. The omitted sites nearly all lacked sufficient digitised daily data. However, the mere selection of one site and omission of another site influences the climate record, means, anomalies, and trends. The selection, substitution, deletion, and addition of the Acorn sites is not value free and has its own non-climatic influence on the record. 6. New sites: Acorn has introduced new sites for the 100 year record. As discussed in previous paragraphs, the choice of these sites has an impact on the record. While the Acorn network keeps approximately the same proportional distribution north/ south and inland/ coastal as the HQ network, it is intended that more sites will be added in future, especially in remote areas. 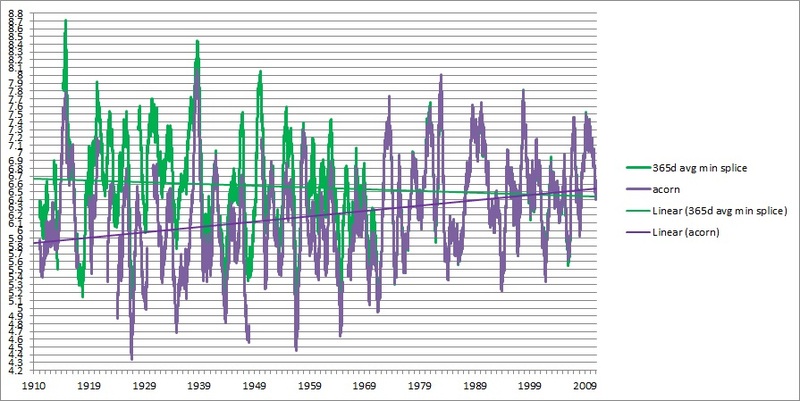 Although the necessity of having more sites in remote areas is obvious, if more sites are added in northern Australia or in the outback, any warming signal will be intensified as northern and inland sites have much larger swings than coastal and southern sites (see MAN analysis here and here), therefore any warming trend will be exaggerated. 7. Several sites sampled contain spurious data, either due to human error or unchecked blanket application of the adjustment algorithm (evident in month by month adjustments), that indicate quality control may not be adequate. 8. 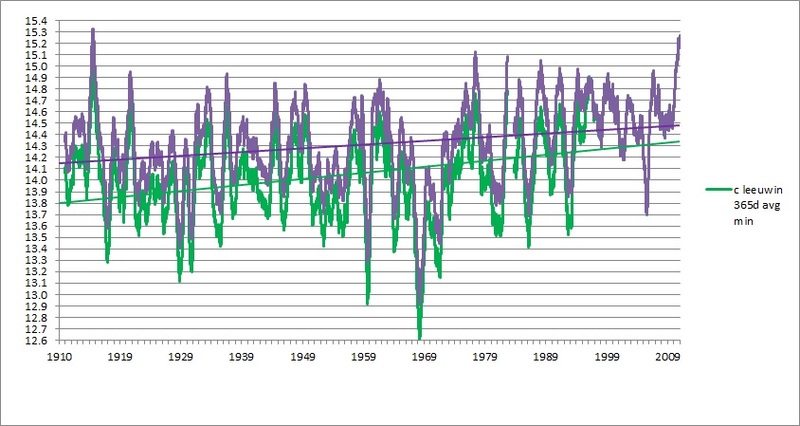 While Acorn is supposed to better compare (and reduce) extremes, at several sites new (and more extreme) records are established, and more extreme temperature swings are created. 9. 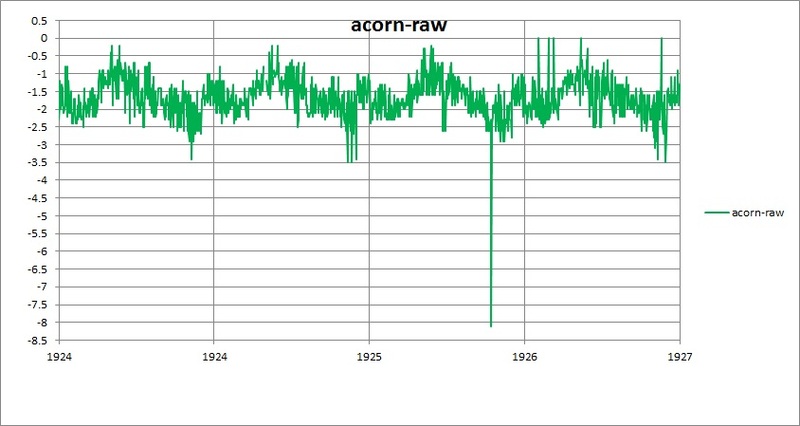 It is impossible to replicate the ACORN-SAT record at some sites with the available data and information. 10. An international panel was invited to review ACORN-SAT prior to publication. (Note: this does NOT constitute standard peer review.) They made some interesting observations and a list of recommendations, to which the Bureau has responded. Here are some observations, with my emphasis. 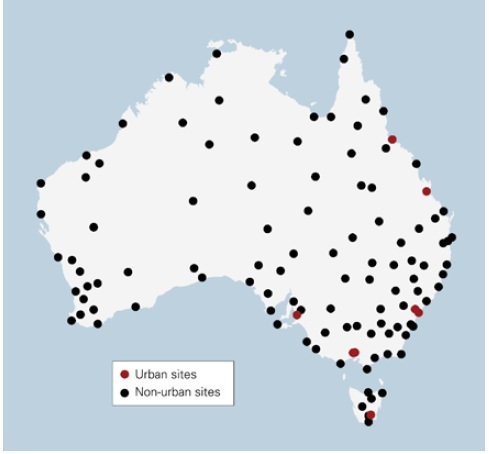 (T)he surface temperature observation network fails to meet the internationally recommended minimum spatial density through much of inland Australia. From west to east Australia is about 4,000km, which is more than the distance across the USA. The WMO Guide states that an acceptable range of error for thermometers (including those used for measuring maximum and minimum temperature) is ±0.2 °C. However, throughout the last 100 years, Bureau of Meteorology guidance has allowed for a tolerance of ±0.5 °C for field checks of either in-glass or resistance thermometers. This is the primary reason the Panel did not rate the observing practices amongst international best practices. The Bureau has advised that for privacy reasons regarding observers the Bureau cannot make its metadata database publicly available through the internet. However, the Panel considers that for transparency reasons it would be useful if sufficient metadata to allow independent replication of homogeneity analyses for individual ACORN-SAT sites was included within the public ACORN-SAT station catalogue being developed by the Bureau. 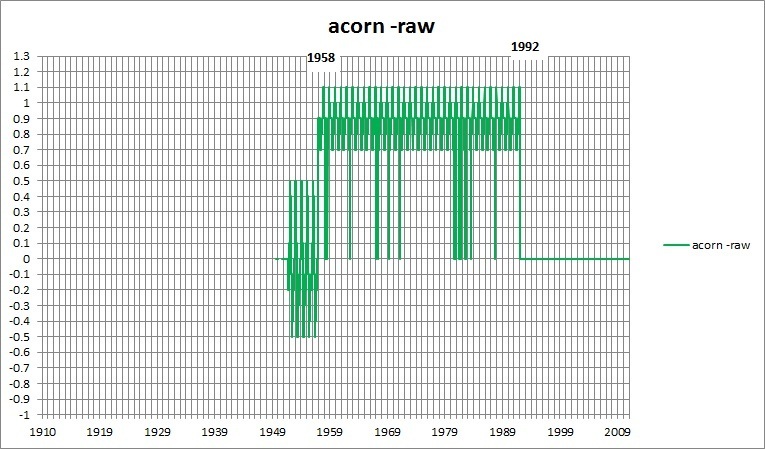 Acorn adjusts the record in two phases: 1. Detecting discontinuities and 2. Homogenising. These processes are described in detail in CAWCR Technical Report No. 049 by Blair Trewin. 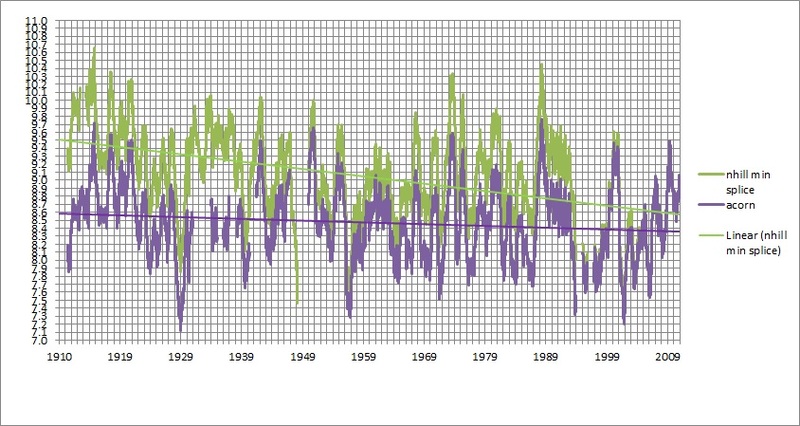 While the techniques used to detect discontinuities by comparing “neighbouring” station records (stations that are in the same climate regime, having similar climatic variations) are widely used internationally, the adjustment techniques used in Acorn have not been used outside Australia at a national-level. This is a first for BOM, so let’s hope they have done a good job. 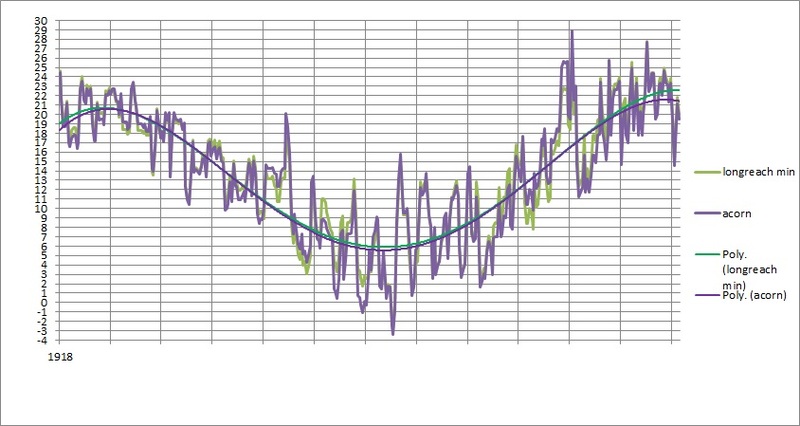 …For each candidate site, testing for inhomogeneities was carried out separately for time series of mean maximum and minimum temperature anomalies for annual means, and for seasonal means for each of the four calendar seasons (Dec-Feb, Mar-May, Jun-Aug, Sep-Nov)…. …For each candidate site, 40 neighbouring site time series were chosen from all available Australian sites with some overlapping data with the candidate site. And 23 sites have no neighbours within 100km! … takes two forms. The first, simpler, form is for the case of merging data from two sites where there is a useful overlap between sites. The second, more complex case, is where there is no overlap (or an overlap too short to be useful), and the adjustment is a two-step process involving the use of neighbouring sites. This complicated process is explained in detail in the above report. Metropolitan (Brisbane Airport), remote desert (Alice Springs), lighthouse (Cape Leeuwin), island (Horn Island), outback (Longreach, Wilcannia), country town (Gunnedah), regional city (Bathurst), and semi-rural (Rutherglen, Nhill). Apart from Horn Island these sites were included in the High Quality Annual datasets. I compare daily temperatures and also use 365 day running means (as the Acorn methodology is based on annual and seasonal means). Where there are more than 10 days in a month with no recordings, I omit the following 365 days means. The Alice is a beautiful town set in the McDonnell Ranges in the centre of Australia. 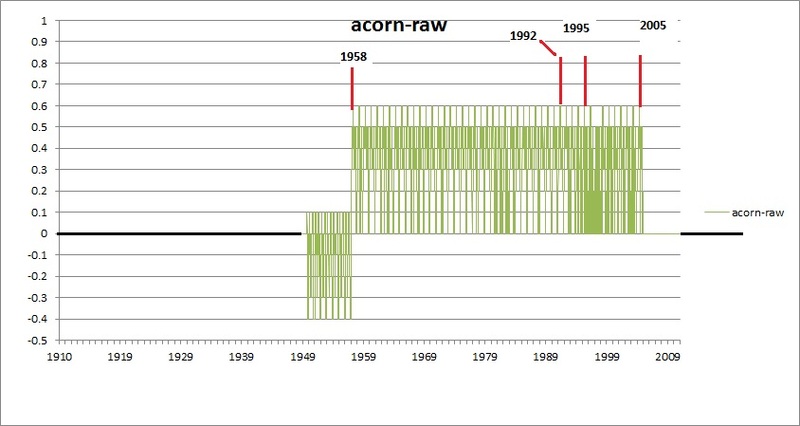 This shows the difference between the Acorn and raw records (Post Office and Airport). The Maxima record has been adjusted to produce extra warming as well. The authors correctly point out that many mistakes enter the record due to human error, amongst other things. The Acorn record, despite being world’s best practice, is not above human error. Here’s a screen shot of one part of the record, 28/1/1944, with the airport’s maximum reading and Acorn’s highlighted. A leading “2” entered instead of “3”. If my laptop can find errors such as this, why can’t BOM’s quality control processes? The Panel considers the ACORN-SAT national anomaly temperature series can be relied on to quantify national climate variability and change. The Panel is aware that one station, Alice Springs, contributes 7-10% of the signal which is why the Panel encourages adding a limited number of stations in remote areas to improve assessment and monitoring of sub-national regional temperature trends. What neighbouring stations were used to make adjustments before the 1950s? There are no sites with overlapping digitised data within cooee of Alice Springs. Oodnadatta and Tennant Creek are about 460km away; there are only very few sites for periods after this. Yet Alice Springs contributes 7-10% of the national warming signal. How much do Giles, Tennant Creek, Birdsville, and Horn Island contribute? Bathurst is a regional centre west of Sydney. 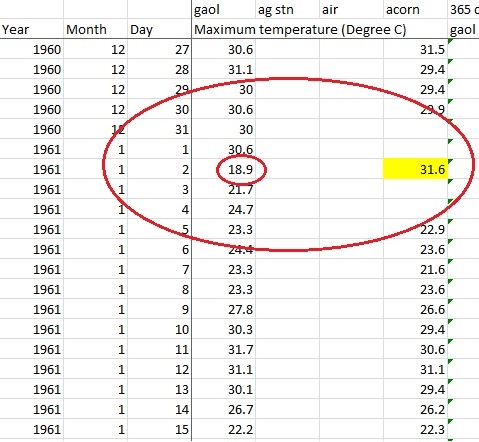 There are no pre-1966 daily data for Bathurst Agricultural Research Station in Climate Data Online, yet Acorn has data from 1910- where does this come from? There is no way of comparing or replicating. The authors of Acorn claim that they do not use data from Bathurst Gaol, but the pre-1966 data looks suspiciously like the Gaol’s. Acorn has 1200 more missing observations than the Gaol, especially around 1950, yet the Gaol (it is claimed) isn’t used, despite having more consistent data. But they get data from somewhere! 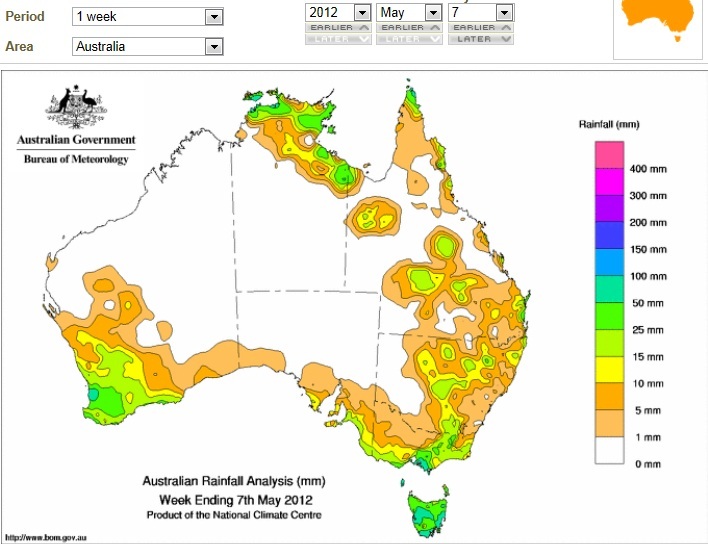 BOM needs to be more transparent about its data sources. 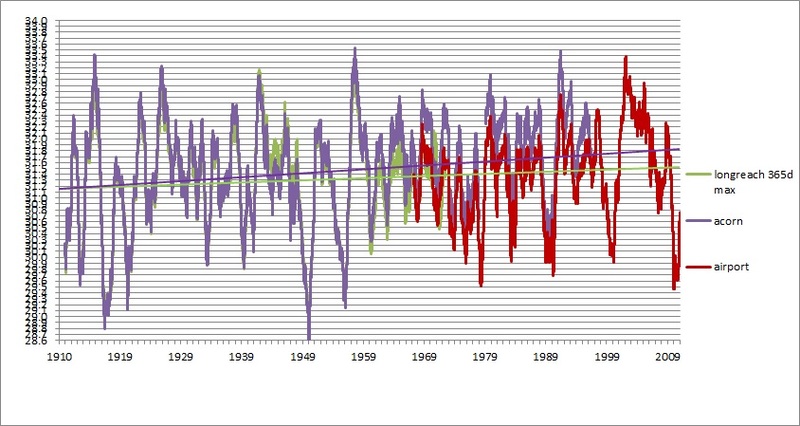 Acorn adjustments are supposed to improve analysis of climate extremes. There was a minimum high of 28.1 on 14/01/1939 at the Gaol, which Acorn reduces to 26.8, the record is 23 for the Research Station; the record low for the Gaol and the Ag Station both is -8.9; Acorn makes the gaol even colder in 1927 by adjusting to -10.6, and the Ag Station -9.1 in 1971. The record high maximum at the Gaol was 40.8 on 11/1/1939; this has been adjusted to 40.7. The Ag Station’s record high was 40.1 on 15/2/2004, and Acorn agrees with this. While Acorn correctly identifies some spurious recordings e.g. a minimum of 16.7 in September 1961, and 2.8 in February 1952, others are questionable. 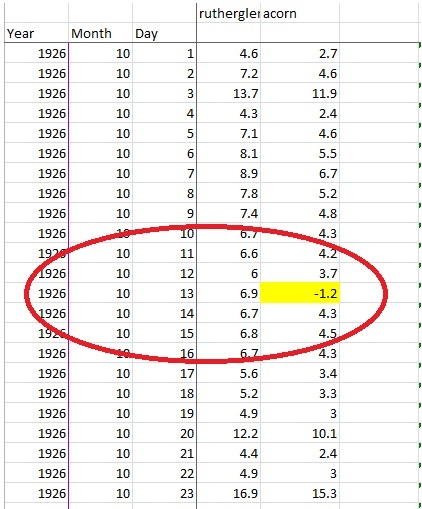 Biggest adjustments were -13.8 on 2/11/1919 and +12.7 on 2/1/1961, when a cool change came through and the temperature dropped from 30.6 on 1st January to 18.9 on the 2nd. Acorn changes this to 31.6, but 40.9mm of rain was measured on the 3rd. The adjustment does not appear warranted. Perhaps they meant 21.6? Brisbane’s Acorn record begins in 1948 with the old Eagle Farm Airport, but this excludes the long previous record of the Regional Office, for no apparent reason- these data are not even mentioned. The result is therefore a warming bias. 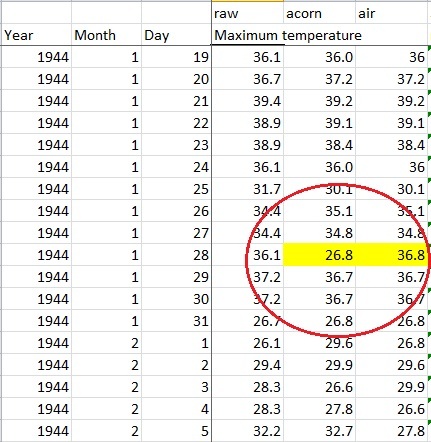 The old Airport’s record high of 39.6 on 14/11/68 has been increased to Acorn’s 40.2 on 22/02/2004, but the Regional Office had a record of 43.2 on 26/01/1940. RO has been ignored by Acorn. 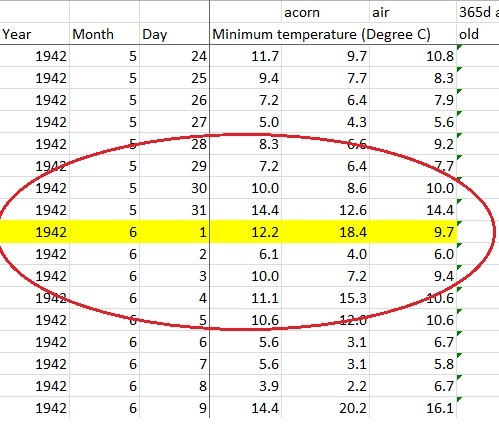 According to Acorn Brisbane now has a new record low of -2.2 on 22 July 1951 at the old airport just a few km from the sea instead of -0.1 on 19/07/2007 at the new airport. Note how Acorn is exactly the same as the Old Airport until the changeover, when it follows the New Airport exactly apart from one day. Laziness? Certainly not quality controlled. Cape Leeuwin is a lighthouse site in the far south west of Western Australia. 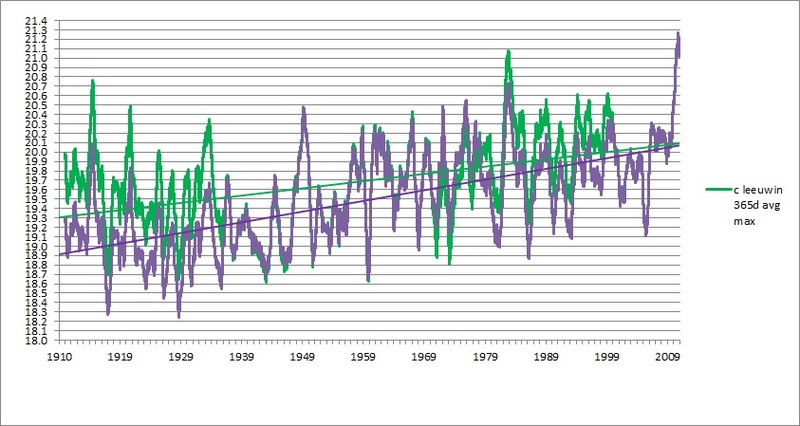 It has had its early maxima cooled, increasing the warming, and minima warmed by about 0.3C up to 31/12/1995, decreasing the trend. 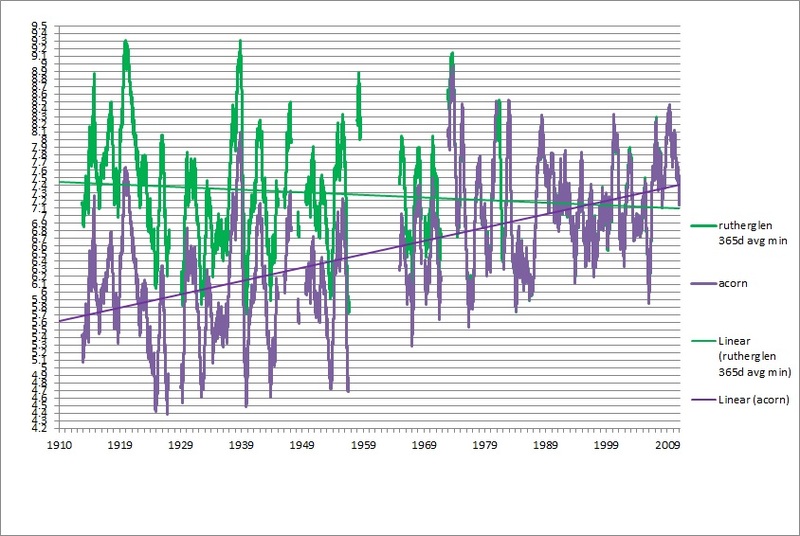 Extremes: Maxima: Record high on 8/2/1933 adjusted from 42.8 to 40.3; lowest minimum on 2/8/1932 adjusted from 10.1 to 9.6. Minima: Record low of 0.0 on 8/5/1960 has been removed as this is spurious- it seems unlikely for a windswept location right on the sea to be freezing. However it has a new record low of 3.8 on 26/6/1956, adjusted up from 3.3. Gunnedah is in northern NSW, just west of the New England Tableland. Acorn follows the Resource Centre temperatures almost exactly, as there is an obvious problem with the Pool records before the early 1960s. Therefore we have to make do with another short record. Horn Island is the island airport for Thursday Island in Torres Strait. These are very messy records, with very little overlap. I found it impossible to make decent splices, so I cannot replicate the record. 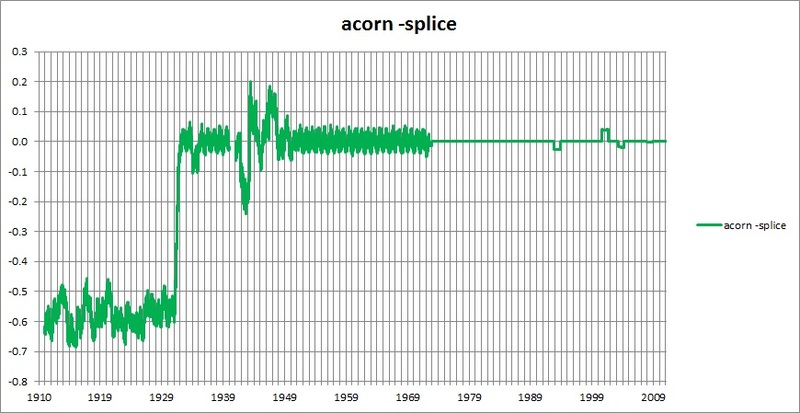 However, it is possible to find where Acorn adjustments and splices are made. The T.I. Met Office is used from 04/09/1950 to 31/12/1992, then T.I. Town data until 31/12/1995, and then Horn Island data. Metadata mentions a site move in 1950s, and the Acorn record is plausibly adjusted. However, what neighbouring overlapping sites were found? Weipa is 236km away, on the western side of Cape York, and has a gap in the 1950s. Palmerville is an inland site 633km away. That leaves Daru in Papua New Guinea, which didn’t start until the late 1950s. Further, the Horn Island minimum data is adjusted up until 30/12/2005, when it reverts to the raw data. The metadata in the Station Catalogue does not mention this, so why was this data adjusted until 6 years ago? According to Acorn’s authors, “In cases where no reference series is available (e.g. remote islands), techniques such as RHtestsV3, which do not use reference series, are also available”. However, there is no explanation for this. The Acorn record cannot be replicated and may be at best a good guess. Longreach is in central western Queensland and is the home of QANTAS. A long overlap between the town and the airport allows us to make a good splice. Comparison shows large adjustments, cooling the first half of the record and warming the second half. 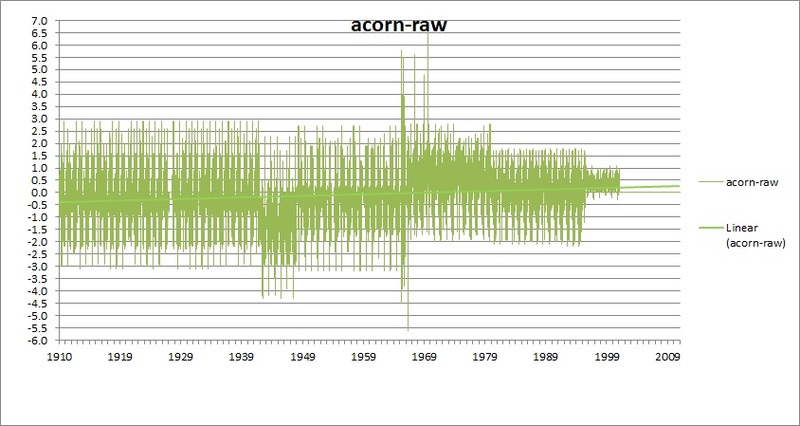 Oddly, Acorn has increased a couple of extreme records. Maxima: 47.9 increased to 49.2 on 26/1/1947; old record low maximum of 10.6 on 5/7/1939 increased to 10.8. A new low record for maxima created on 19/6/1913 of 7.0, adjusted from 11.3. 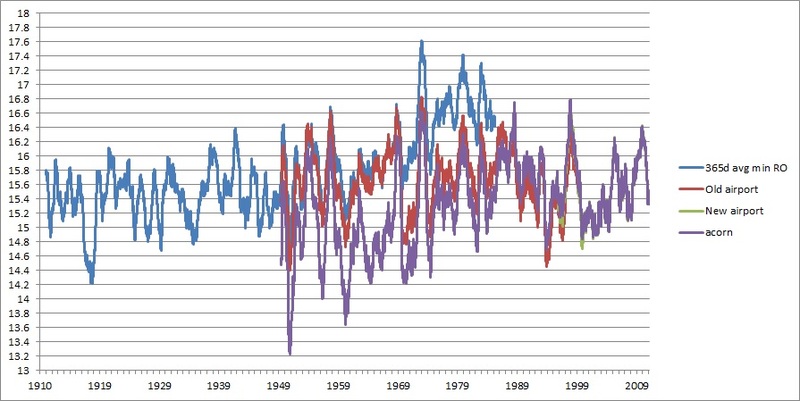 Minima: Highest minima on 26/1/1947 of 31.7 adjusted to 30.4; new high of 31.4 now on 4/2/1968 (up from 27.7). Old record low of -2.8 on 16/7/1918 adjusted to -3.4; new record of -5.4 now on 23/6/1949 (down from -2.2). Nhill is in western Victoria. Its High Quality adjustments were examined closely when I analysed the HQ record. In Nhill both minima and maxima trends are strongly warmed. 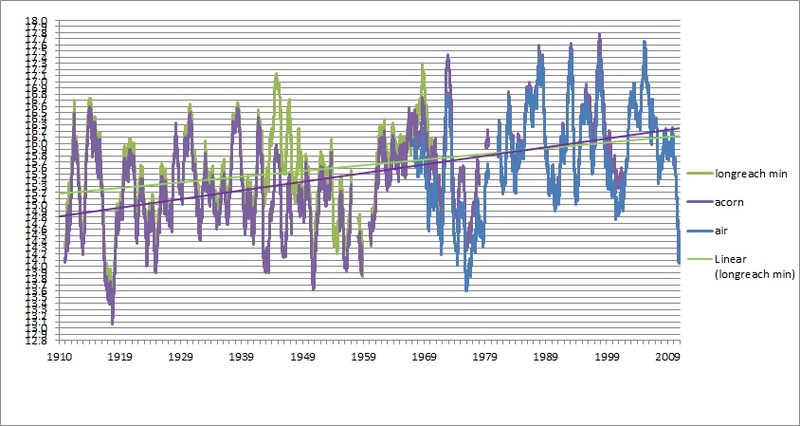 Past hot temperatures are reduced (from 45.9 to 45.4 on 13/1/1939) but past cold temperatures are increased (17/6/1959: -6.5 to -5.2). 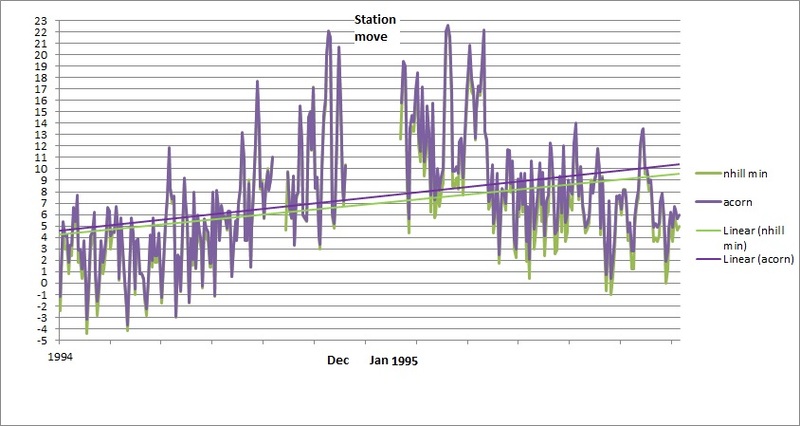 The Acorn Station Catalogue gives no clue that in December 1994 the observer died and the station closed, and there were no observations from 17th December until 17th January. In January 1995 the site had moved 500 m, (to the outskirts of town, a more open location) with no comparative data. Here are graphs for July to June for minima. Note again the month by month adjustments. Note also minima are increased after the site change- the Technical Paper indicates after initial homogenisation, Nhill had an anomalous frequency of extreme cold nights compared with neighbours, so this was corrected. Now this more open location has warmer nights than it did before the move, and cooler days- exactly the opposite of what you would expect. This site is in a vineyard research farm in north-east Victoria. The maxima trend has been slightly cooled, but large minima adjustments have reversed cooling and produced steep warming. The Acorn record has some other peculiarities as well. 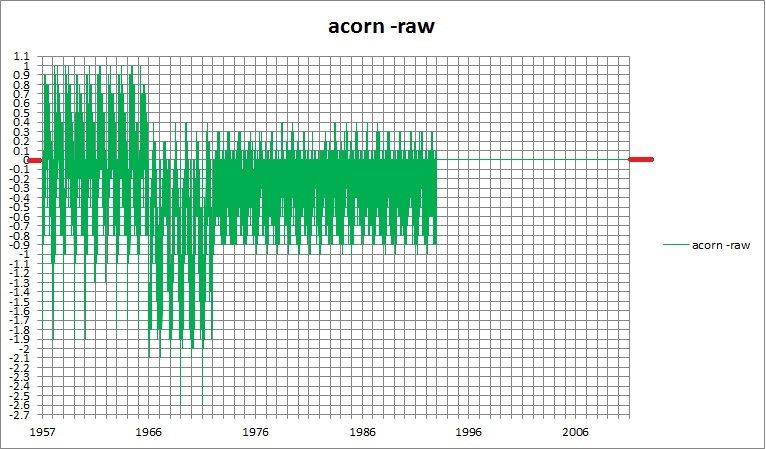 There are several separate periods where Acorn’s maxima record is one day too early and has to be corrected. These are: 1/11/1920 – 19/3/1940, 1/12/1940 – 31/10/1944, 1/5/1946 – 31/10/1947, and 1/12/1947 – 31/1/1948. How did that slip through quality control? Even after this has been corrected, there is another glaring error of an adjustment of -8.1 degrees. The record minimum low has been changed. In the raw data it is on 14/06/2006, -7.5. 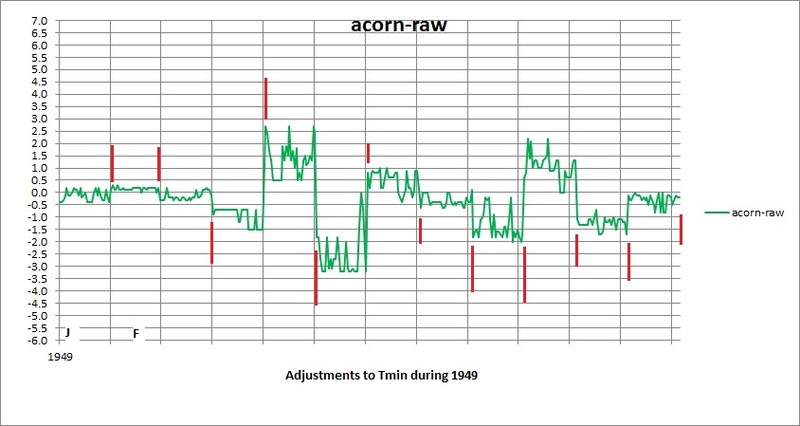 Acorn has it as -7.9 on 14/08/1913. 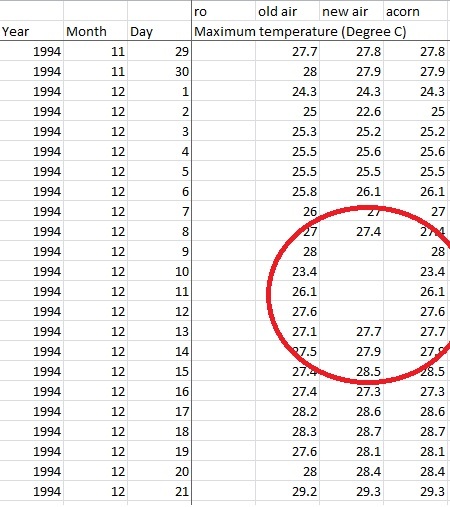 Similarly the record minimum high is changed from 29.2 on 24/12/1942 to 29.0 on 12/01/1982. 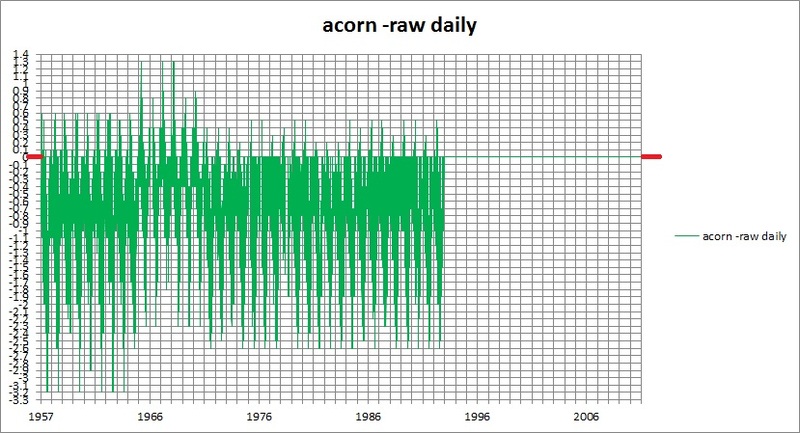 The Diurnal Temperature Range shows raw increasing, Acorn decreasing. Wilcannia is in far western NSW and its record is plagued with missing data. 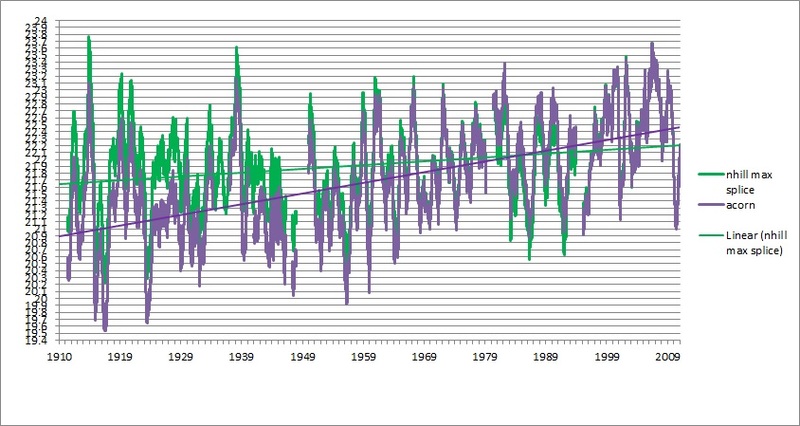 Acorn produces a major warming of the short record. Maxima- lowest maximum on 8/7/1978 adjusted from 7.1 to 6.5; record high on 1/3/1973 adjusted from 48.2 to 47.4. 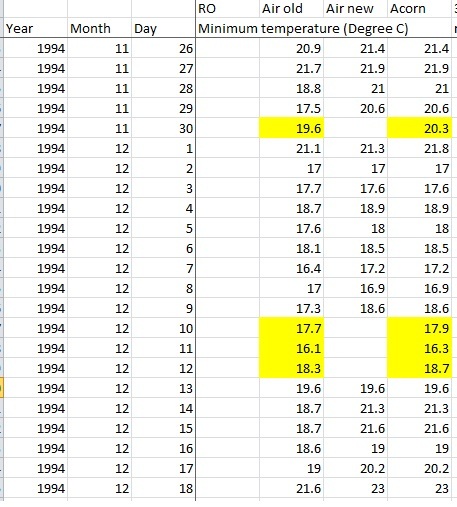 Minima- a new record low on 18/7/1977 adjusted from -5.0 to -7.2; no change to highest minima of 33.4 on 21/12/1994. This analysis of 10 representative sites shows that Acorn has a number of problems which must be addressed. C1 A list of adjustments made as a result of the process of homogenisation should be assembled and maintained and made publicly available, along with the adjusted temperature series. Such a list will need to include the rationale for each adjustment. C2 The computer codes underpinning the ACORNSAT data-set, including the algorithms and protocols used by the Bureau for data quality control, homogeneity testing, and calculating adjustments to homogenize the ACORN-SAT data, should be made publicly available. An important preparatory step could be for key personnel to conduct code walk throughs for members of the ACORN-SAT team. C3 Both the raw and the homogenized ACORNSAT data-sets should be analysed with the same gridding and trend analysis method, to identify the effects of the data homogenisation. C5 The Bureau is encouraged to calculate the adjustments using only the best correlated neighbour station record and compare the results with the adjustments calculated using several neighbouring stations. This would better justify one estimate or the other and quantify impacts arising from such choices. The Bureau’s responses to all of the review panel’s recommendations are listed here. Some are very enlightening: BOM appears to be not as keen on public accessibility as the review panel recommends! 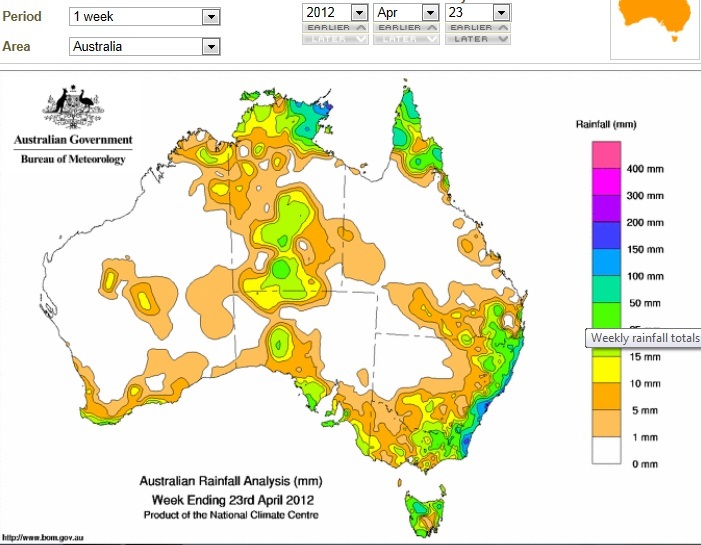 BOM is quite happy to calculate monthly means for months with up to 12 missing days. No mention is made of short length sites. The Panel’s overall confidence is derived from its close examination of the Bureau’s observation practices, its network selection methodology, its approach to data homogenisation, and its methodologies for the analysis of trends. All of these factors need to be satisfactorily handled before stakeholders can be confident about findings based on the data; a failure in any one of these factors will result in a loss of stakeholders’ confidence in the system as a whole. But the confidence of public stakeholders needs always to be nurtured in other ways as well. For that reason the Panel has placed special emphasis in its report on the need for good communications and greater transparency of the development and operations of the ACORN-SAT system. A side benefit of this transparency for the Bureau is that useful suggestions for improvements and refinements to the ACORN-SAT system will almost certainly be made. You are currently browsing the kenskingdom blog archives for May, 2012.